Today is my 200th post… We have winners! One of you will win the Vesper Astro and the other will win the Yarn Pirate Calamity. Congratulations to both of you! 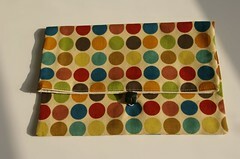 On today’s Etsy Friday I will show you my latest purchases. 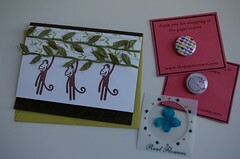 I ordered this cute little card for my Monkey Sock Swap pal from The Paper Crown. I thought the monkeys swinging in the branches were just adorable. You can’t really tell in the picture but I had them write “To my Monkey Sock Swap Pal!” in the front. You can see it better here. I also received these 2 cute little pins and a flower sticker. 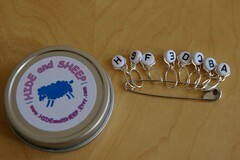 I also ordered a set of lettered stitch markers from Hide and Sheep in preparation of getting the book “New Pathways for Sock Knitting” by Cat Bordhi. I made another purchase (non-etsy) that I’d like to share with you. A few weeks ago I found this blog: Good Natured Ribbing where multiple bloggers post. One of them, Beth just opened an online store with her husband, Knitzi. They currently sell 2 products: Knitzis and bags. If you knit your socks on double pointed needles, or use them for anything else, you really gotta check Knitzi out. They came up with a very pretty way of traveling with your sock in progress. Since I don’t use dpns I went and bought one of their bags! It’s the perfect size for sock in progress and I’ve been enjoying using it already. If you hadn’t heard from them yet I’d definitely go check them out!